Derived from a Sanskrit word, "shawl" is a simple item of clothing worn over the shoulder, upper body and arms or sometimes over the head. Shawls have been worn in every culture though out the centuries by men as well as women. 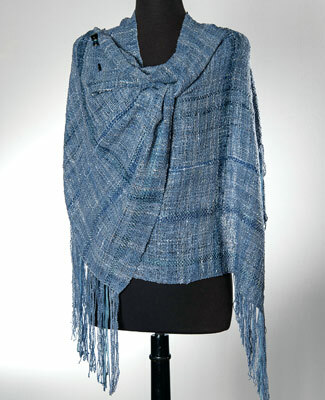 The shawl I have designed and woven, is a federal blue/grey color of hand dyed cotton, linen and ribbon. It can be wrapped in various ways and held with the included shawl stick. Be creative and enjoy your style!